The weather here in Chicago has been teetering slightly warm, a little cool, somewhat dry, and fairly wet. (As they say here in Chicago, if you don't like the weather, wait 10 minutes!) But I think mother nature has made it known that fall is definitely here in Chicago. The leaves of the trees have started to turn rich autumn colors and chilly breezes have been felt when the windows are open. Ever since fall officially started, September 21st, I wanted to have a dinner with recipes that highlight some of my favorite fall ingredients. It just didn't feel like the right time to have a fall dinner, until now. Everything was as delicious as I hoped and then some. My guests loved how the flavors complimented each other and all the dishes highlighted a bit of fall. Be sure to check back all this week for recipes of the above dishes I served. Hopefully the menu will inspire you to host an autumn harvest dinner too! Yum! This all looks so delicious! Oooh, you're such a tease... that chicken looks delicious. As do some of those cupcakes you posted earlier. I can't wait to get the chicken recipe though... add that to the romesco I've recently learned to make and it will add a couple really nice chicken recipes to my repertoire! The chicken looks fantastic!! Can't wait for some recipes!! 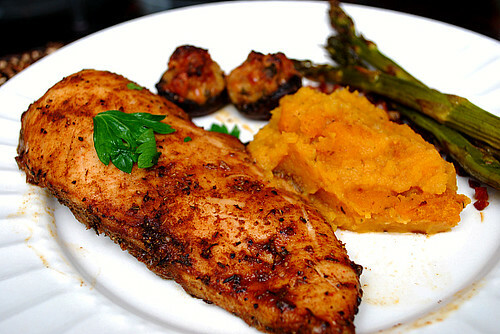 The maple and spice glazed chicken sounds yummy. Can't wait for the recipe. All of that food looks so delicious! I can't wait to see try the mushroom recipe, I'm constantly on the lookout for stuffed mushroom recipes!